M-O-O-N, that spells Alright, alright, alright! The big screen version of Stephen King’s mammoth end of days novel "The Stand" has been in the works over at Warner Bros. for quite some time -- with only a few whispers of developmental details every now and then (remember when Ben Affleck was attached to play Stu Redman?). However, Deadline has given us a little tease of what we can expect, on the casting end, anyways. 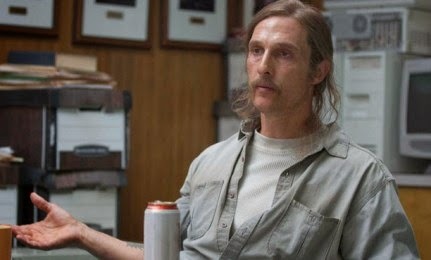 Warner Bros. has expressed a desire to see Matthew McConaughey slip into the Texas tuxedo of Randall Flagg, played so wonderfully by Jamey Sheridan in the 1994 made-for-TV movie version of "The Stand." Randall Flagg, as most King fans will know not only from "The Stand" but also his appearance in "The Dark Tower" series, has been described by the studio as "the personification of evil." While McConaughey has been showing his range as an actor for the past few years now, can this seemingly affable leading man pull of playing Satan himself? Hopefully now, with a big name circling around the production, we will find out sooner rather than later.